The global chocolate industry has been in a moderate growth trajectory since the last five years. This growth is largely fueled by the increased global demand for premium chocolate. The major developing countries such as China and India are expected to offer great opportunities to the global chocolate industry; thanks to the use of chocolate as a functional food. Organic and fair trade chocolate is a rapidly growing segment of the industry. With consumers developing more awareness regarding environment-friendly products, this segment is expected to rise rapidly in the next five years. One of the major concerns for the chocolate industry is the rising number of counterfeit products. This is a great threat for the overall confectionery market and chocolate is no exception. The global chocolate market is highly consumer driven and companies need to focus on their development and marketing strategies towards capturing a larger consumer base, and acquiring new markets. The major strategies used are consolidation of processes, and enhancement of brand image through corporate social responsibility. Cocoa is the main raw material for chocolate production and has no other substitute. Moreover, it can only be grown within 10 degrees (latitudes) of the equator. Due to this constraint, global production of cocoa is highly concentrated in West African countries such as Ghana, Cote d'Ivoire, Cameroon, and Nigeria. The cocoa fruit is harvested twice a year in the form of a main crop and an intermediary crop (also termed as mid-crop). The main crop is larger than the mid-crop though the relative size varies according to the country where it is produced. Emulsifiers are basically used in food and pharmaceutical applications. The global emulsifier market was valued at around $1 billion in 2010. Lecithin has the highest share of around 30% of the global emulsifiers market. Vanilla is the most preferred flavor in the chocolate industry. A number of other important flavors such as mint, coffee, strawberry, and orange are being increasingly used these days as the consumer is more open to experimenting; however, the traditional chocolate flavor is still the most sought-after. Almost 90% of the total vanilla used as a flavor is synthetic. The major demand for sugar is fueled by the manufacturing and food preparation sectors, including the beverages market. Developing economies such as India, China, and Indonesia are expected to account for more than 3.2 million tons (72%) of the overall sugar consumption by 2015. These are the same countries expected to witness high CAGR in the global chocolate market. The growth in the overall sugar market is attributed to India, a result of the expansion in the sugarcane area, and generally favorable weather. In this report, under the raw materials section, an in-depth analysis of cocoa, sugar, emulsifiers, and flavors has been done with respect to their contribution to the chocolate industry. Competitive information includes market shares of leading producers, key developments, and strategies deployed to win. Major companies analyzed in the company profiles section include Nestlé (Switzerland), Barry Callebaut (Switzerland), Kraft Foods (U.S.), Mars (U.S.), Ferrero (Italy), and Hershey (U.S.). The purpose of the report is to highlight points that are actionable for its stakeholders. The report features more than 130 tables and figures, including market numbers, and also forecasts the chocolate market scenario till 2016. Each section will provide market drivers, trends and opportunities, top-selling products, key players, and competitive outlook. This report will also provide market tables for covering the sub-segments and micro-markets. Cocoa is believed to have originated in Amazon in around 2000 B.C. Mayans consumed chocolate as drinks as early as the sixth century. Today chocolate is estimated to account for 55% of global confectionary sales; followed by candy with 31% and gum with 14% of sales in 2009. Some of the major drivers of the industry identified in this report are health benefits, large variety of applications, and seasonal & festive sales. The major restraints identified in this report are raw material prices and the dependence of the industry over unstable economies for cocoa supply. Major threats the industry is facing are the rising counterfeit market and changing consumer preferences. There are some opportunities capable of changing the dynamics of this industry; such are lower penetration in developing economies, organic and fair trade chocolate, and use of chocolate as functional food. The global chocolate market is estimated to reach $98.3 billion in 2016 from $83.2 billion in 2010, at a CAGR of 2.7% from 2011 to 2016. The market in Asia is driving the sales and is expected to hold 20% of the global market share in 2016. The Asian market is expected to have high growth of CAGR 4.7% due to lower penetration and sales of Asian region are expected to boost their share from $15 billion in 2010 to $19.7 billion in 2016. The U.S. leads the chocolate market in North America with around 86.3% market share while Japan leads the Asian market with 39.7% of market share. Within Europe, UK draws the largest demand with 16.4%; followed by Germany with 15.9 % market share. The dark chocolate segment is expected to have the highest CAGR of 5.2% in the next five years due to the health benefits resulting from its high cocoa content. 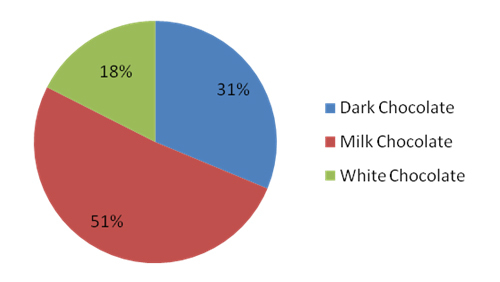 A majority of consumers are opting for dark chocolate over white and milk chocolate. Milk chocolate constitutes the largest segment with a value of $42.6 billion and is expected to grow to $46.9 billion in 2016, at an estimated CAGR of 1.6% globally. While milk chocolate has the benefits of cocoa, it is not bitter in taste and provides a healthy alternative to the high cholesterol sweets. 9.21 RUSSELL STOVER CANDIES INC.
9.24 MEIJI SEIKA KAISHA LTD.